The knee is quite a complex joint, and is involved in more day-to-day functions than one might think. Whether you have an ongoing discomfort condition or a severe injury, knee pain can be a major obstacle. This discomfort can prevent more aggressive physical lifestyles– like contact sports– altogether. For patients undergoing orthopedic recovery processes, active exercises might be an impossibility. Rather, low-impact exercises can carry health the benefits of motion, without the drawbacks of more involved activities. In this post, we’ll detail how low-impact exercises can aid in recovery, and the benefits that they carry. Isn’t Resting Better Than Exercising? Maybe in the short term, but not for the long haul. As far as the function of your body is concerned, a decreased range of motion is the primary consequence of an injury. The same is true for orthopedic knee injuries– especially those involving muscle or tissue damage. And, the goal of any orthopedic treatment process is restoring the range of motion. This generally involves physical therapy, along with guided exercises, and if necessary, more serious procedures such as surgery or joint replacement. While resting is an important aspect of recovery, exercise is an often overlooked element. From an orthopedics perspective, engaging in deliberate (albeit carefully selected) exercises is critical. Doing so naturally restores the knee’s range of motion, without the potential for side effects. Planning exercises that gradually increase in intensity is the fundamental principle behind sports medicine. This is especially true for back pain, but applies to knee pain as well. And, the type of injury can determine which type of exercise will be most beneficial. Unlike more aggressive, results-driven exercises, low-impact exercises are not taxing on the body. For some orthopedics patients, it’s easy to dismiss simple low-impact exercises as pointless. If the sports medicine diagnosis calls for them, however, low-impact exercises can be quite helpful. Technically speaking, low-impact exercises are those in which the patient keeps one foot on the ground. Maintaining a cardiovascular habit, without involving the lower half of the body, is a perfect orthopedic solution. However, this does not mean that the exercises leave the legs out of the equation altogether. In fact, low-impact exercises often work out the legs, without ever placing undue pressure on them. How does Low-Impact Exercise Differ From High-Impact Exercise? The defining characteristic of a low-impact exercise is that they are easy on the knees. This means that low-impact exercises are a simple and often pain-free activity– or at the very least, cause minimal pain. Low-impact exercises are not only for people with knee injuries (or even those with pre-existing conditions). Even people who have never experienced a knee injury may occasionally benefit from low-impact exercises. 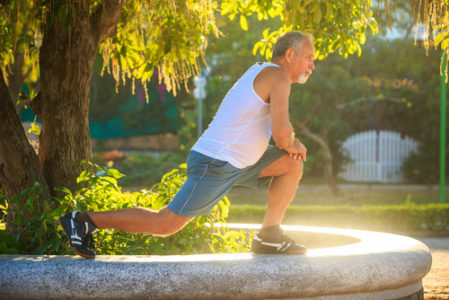 Allowing the lower half of your body to enjoy a reprieve from activity will cultivate a healthier lifestyle, especially with the guidance and input of a qualified orthopedist. Running is a major example of a high-impact exercise. This common workout involves bringing the legs up and down rapidly. Running can be especially taxing during the early winter months, where your knees may have difficulty adjusting to the brittle lower temperatures. And, at the end of the winter, moving from the treadmill back outdoors can also be a struggle. Regardless of the time of year, moving from the treadmill back outdoors can also be Other high-impact exercises involve jumping, and more critically, landing. What are Common Examples of Low-Impact Exercise? Low-impact exercises are not uncommon– and they tend to be a fun change of pace for orthopedics patients, too. Cycling: Despite relying on both the legs and knees, cycling is an easygoing (and nonetheless intense) exercise that will help you to meet your fitness goals. The less rugged the trail or route, the better it is for your knees. Walking: Switching from running to walking should be a relatively simple adjustment. This will help you to maintain your routine, with minimal impact to your joints. Elliptical: Because the elliptical keeps your feet above the ground, none of your steps will have a heavy impact like a treadmill. Rowing Machine: Many people enjoy the rhythmic flow of the rowing machine. This exercise works out the legs, without impact-related injuries. Kayaking: If you’d prefer actual boating to a simulation, then kayaking is a great example of low-impact exercise, too. It exercises your arms and core– not to mention your mind. Lifting: Lifting exercises that are less demanding than others can also qualify as valuable low-impact exercises. Yoga: Yoga is conceived as a gentle way to strengthen (and maintain) your body’s flexibility. It improves posture, and is also quite relaxing. In combination with other orthopedic treatments, yoga is also a fitting treatment for sciatica. 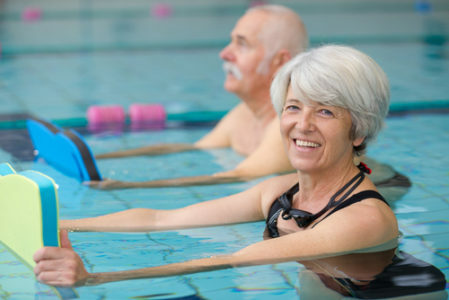 Water Aerobics: Swimming is generally considered a relaxing and low-impact exercise– but without the proper preparation, it can cause injuries. But, for orthopedics patients who are still unable to perform strokes, water aerobics is a viable (and rewarding) substitute. To find the best low-impact exercise for your body, consult with a qualified orthopedic specialist. Continuing to follow the same problematic exercise routine will eventually affect your long-term health. The team at Central Orthopedics can help you to find exercises that are fit for your health. Contact us to schedule an appointment, and begin improving your health and lifestyle!